The National Academies of Sciences released a new report on Next Generation Earth System Prediction: Strategies for Subseasonal to Seasonal Forecasting that presents a vision of making subseasonal to seasonal forecasts (from 2 weeks to 12 months) as widely used as short-term weather forecasts are today. SCIPP team member, Mark Shafer, participated on the committee that drafted the report. The report presents a research agenda that emphasizes increasing the skill of forecasts; expanding the breadth of forecast models and variables; improving the prediction of extreme and disruptive events; and bringing researchers and decision makers together to develop more actionable forecasts. The “S2S” forecast scale represents a gap between short-term weather forecasts (out to about 2 weeks) and climate models that look at inter-annual to decadal changes. Improving forecasts in the S2S time frame presents an opportunity to improve planning and preparedness, from anticipating resource needs for the upcoming season to pre-positioning supplies in advance of a period of active severe weather. In addition to improving predictions, the report emphasizes connection between researchers, operational meteorologists, and people using weather and climate forecasts to determine the appropriate time and spatial representations for products, needed variables beyond average temperature and precipitation, and understanding decision-processes to ease integration of new information in users operations. 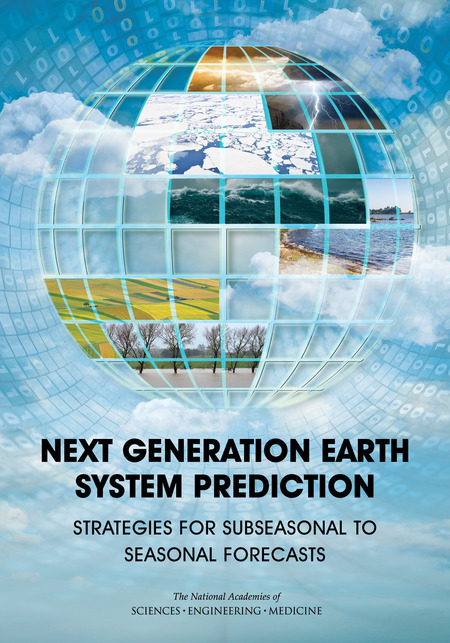 The report is available on the National Academies publication site, http://www.nap.edu/catalog/21873/next-generation-earth-system-prediction-strategies-for-subseasonal-to-seasonal.